Today we are interviewing R.D. 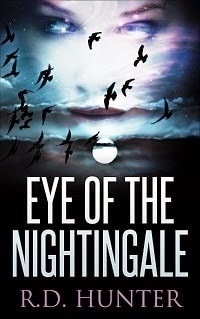 Hunter, author of the paranormal/mystery novel, Eye of the Nightingale. I was born and raised in the foothills of North Carolina. I’ve spent most of my adult life working it some form of law enforcement. I’ve always had a passion for writing, but only recently decided to start taking it seriously. Once I did, I was hooked. There’s nothing quite like seeing this plot that’s been running through your mind splayed out on the page in front of you. Describe the plot of Eye of the Nightingale in a few sentences. The main character is Ava Foster, a young student nurse with the unwanted ability to sense other people’s emotions. When she’s assigned to a rest home as part of her clinical rotation, she’s shocked to uncover a web of patient abuse and neglect. In order to blow the whistle on those responsible, she has to learn to use those empathic abilities in ways she’s never dreamed of before. What do you like about the paranormal mystery genre? They go really well together. I don’t know anyone who doesn’t like a good mystery, and the paranormal genre compliments it nicely. It makes you think you know what is going to happen next, but then something totally unexpected can happen and it’s all right. It’s accepted. Tell us about the main character, Ava Foster. She’s tough, but she’s had a rough life so far. Her empathic abilities manifested in her early teens, and we all know how difficult those years were. Since then, she’s struggled just to get through the day without losing touch with herself, without letting someone else’s emotions cloud her own. But, she’s done it. She’s finishing up nursing school, which is a feat unto itself. Then, just when she thinks she’s got a handle on everything, she has to learn to use these abilities she’s shunned her entire life to help other people. The fact that she’s so driven to go through with it says a lot about her character. Is there an author who has influenced your writing style? I love Dean Koontz. The way he makes his characters so relatable is a talent few possess. I’ve tried to accomplish that as well, but in my own way. I’m actually working on a sequel to Eye of the Nightingale, entitled Silence of the Nightingale, due out this summer. Just that I had a blast writing it and I hope others have a blast reading it.